Butte County/Plumas County burn permits suspension. Effective as of midnight June 30, 2010 open burning of dooryard debris piles will be banned in Butte County and state responsibility areas of Plumas County. The annual suspension of burn permits goes in to effect each year on July 1 in response to warmer weather, lower humidity and dry fuels. The proclamation affects the unincorporated areas of Butte County only. The suspension will remain in effect until the fire chief determines it is safe to resume burning countywide. The cities of Biggs and Gridley will not be affected by the burn permit suspension. The city of Chico does not allow dooryard burning at any time during the year. The town of Paradise suspended dooryard burning as of May 31, 2010 and will suspend all provisional burn permits as of July 1. The city of Oroville will institute a ban as of July 1 in coordination with CAL FIRE/Butte County Fire Rescue. Agricultural burning will not be affected by this suspension. Those parties conducting agricultural burns are reminded that they must posses both an Air Quality Management District agricultural burn permit and a valid Butte County Fire Department burn permit. Butte County Fire burn permits may be obtained at any staffed, local CAL FIRE/Butte County Fire Rescue station free of charge. Agricultural burn permits may be obtained at the Air Quality Management office in Chico at 2525 Dominic Dr., Suite J.
Debris burning of dooryard piles is historically one of the leading causes of fires in Butte County. Individuals found burning during the suspension period will be subject to appropriate civil or criminal action. Contact your local fire department if you are unsure of the burning restrictions in your area. The City Council wants to take a closer look at contracting out fire services even as the local fire union plans to vote on a city compensation proposal this week.The International Association of Fire Fighters Local 2805, the union that represents Gilroy firefighters, is set to vote Wednesday on contract concessions proposed by the city. The vote comes a week before a year-long contract concessions agreement between the fire union and the city is set to expire. Meanwhile, the council directed city staff earlier this month to look at the idea of contracting services with other agencies, such as CalFire or the Santa Clara County Fire Department. "To me, this is not a negotiating tactic," Councilman Perry Woodward said this week. "It's not a way to bring the union to heel on some short-term issue. This is about making the current retirement system work." At the council's June 7 meeting, Woodward requested city staff provide the council with information about contracting out fire services with CalFire. Councilman Bob Dillon wondered if the council also should look at contracting with the Santa Clara County Fire Department, and Woodward agreed. With a unanimous thumbs-up vote, the council directed city staff to place the matter on a future council meeting agenda. City Administrator Tom Haglund said this week that city staff aims to have a report ready by the council's July 19 meeting. The report will include information about what would be required to make such a switch, Haglund said. Specifically, it would cover legal matters, such as issues related to Local 2805, as well as information about a "level of service" agreement and the timeline for making a switch. The report will not include bids, as the city has not outlined a scope of services that it desires, Haglund said. "This is not going to be geared toward making an instant decision," Haglund said. Woodward expressed concern this week that retirement plans for city employees are not sustainable. Like most other council members, he is pushing for a two-tiered retirement system in which new employees would receive a different set of benefits from current employees. The fire department would be a good place to start, he said. "You've got to start somewhere," Woodward said. "The fact of the matter is the firefighters have been the most aggressive in the way that they've negotiated with the city in the past 15 years." Woodward and other council members have criticized the fire department in the past for its use of binding arbitration, a system in which a third-party arbiter chooses between the final offers of the city and union if either party decides labor negotiations are at an impasse. Police and fire unions have said it is their prime bargaining chip, as public safety workers are not allowed to strike. Recent negotiations between the city and fire union also have been tense. The fire union made a one-year concession with the city last year for this current fiscal year that included about $500,000 in savings to the city, and the city has asked Local 2805 to extend those concessions. If they are not extended, Local 2805 will receive an 8.44-percent increase in compensation starting July 1, plus an additional 1.5-percent increase in 2011, city officials have said. Although council members say they cannot comment on specifics of the negotiations, Woodward expressed frustration with the process. "I think that (firefighters) are having a hard time coming to grips with the fact that structural change is upon them," he said. "This is a new era of public employment." Jim Buessing, secretary and treasurer of Local 2805, also would not comment on negotiations, although he said there have been several meetings between the city and the union. He also would not comment on the council's desire to look further into contracting out fire services. "We don't know what the terms or the costs would be," he said. Steven Woodill, CalFire's unit chief for Santa Clara County and fire chief of the South Santa Clara County Fire District, said the agency has contracts with cities throughout the state, including in several cities in Riverside County. Although CalFire has a contract with the South Santa Clara County Fire District, which oversees fire protection in the South County's unincorporated areas, it does not have any contracts with any of its cities, he said. None of the cities in Santa Clara County have formally approached CalFire, he said, although Woodill said he occasionally receives requests for information. Before the agency could provide a bid, CalFire and city officials would need to sit down for formal discussions and CalFire would need a request for proposal, he said. "It's very hard to quantify cost," he said. "You have to be very specific about the level of service that a given entity wants." Meanwhile, Santa Clara County Fire Department has contracts with nine cities, including the South County city of Morgan Hill. Like CalFire, the Santa Clara County Fire Department has no interest in seeking contracts with cities that have not approached them, Assistant Chief Steve Staump said. "We are not imperialistic to go in some place where we have not been invited," he said. Some cities have approached the department in the past to save money, while others have done so because they want an improvement in service, Staump said. "Are there cost savings in some areas? Absolutely," Staump said. "Are we the cheapest around? Maybe not." Woodward wants to learn whether the city would experience savings with CalFire, and if so, why that is the case, he said. Council members have said these are dire economic times, and the city must take a long-term look at the impacts of city benefit and retirement plans. "We've got to take a look at what's in the best interest of the community, not what's in the best interest of a union," Councilman Craig Gartman said. Location: End of Sky Harbor Road near Fine Gold Campground in Fresno County; 30 nearby homeowners were told to stand–by and be ready for evacuation. Crews say the wind did pick up around 6pm, playing a part in how quickly the fire spread. Containment: 250 acres 20% full containment expected Wednesday night. Conditions/Terrain: Steep rough country, limited access, mostly tall grass and woodland oak, San Joaquin River drainage, good potential for spotting with afternoon winds. Cause: under investigation.Fire crews do not suspect arson. Previously known as the "Fine Fire." renamed "Millerton"
275 acres - 45% contained. Update: 6-23 am - Containment expected this evening. SANTA BARBARA, Calif. (AP) - The U.S. Coast Guard has resumed the search for a kayaker who went missing last weekend off the Santa Barbara County coast. Lt. j.g. Stephanie Young says a patrol boat began scouring the waters Tuesday morning and a helicopter will join the hunt later. The Coast Guard and local authorities will be searching a 170-square-mile area for Sean Fleming, a firefighter with the Vandenberg Fire Department. Authorities say the 32-year-old Lompoc man vanished Saturday after taking out his kayak to go fishing off Gaviota State Beach. He was reported missing Monday when he failed to show up for work. Large Incident: A wildfire of 100 acres or more occuring in timber, or a wildfire of 300 acres or more occuring in grass/sage. Wildland Fire: Any nonstructure fire, other than prescribed fire, that occurs in the wildland. Wildland Fire - IMT1: Wildland fire; Type 1 Incident Management Team Assigned. Wildland Fire - IMT2: Wildland fire; Type 2 Incident Management Team Assigned. Wildland Fire - Other: Wildland fire; Other Incident Management Team Assigned besides a Type 1 or Type 2 team (e.g. Type 3). This report will be updated Monday - Friday as significant fire activity occurs. Nationally, fire activity remains light. Three new large fires were reported: one each in Arizona, Colorado and Idaho. Thirty-eight large fires are being managed to achieve multiple objectives throughout the states. Uncontained large fires include only fires being managed under a full suppression strategy. 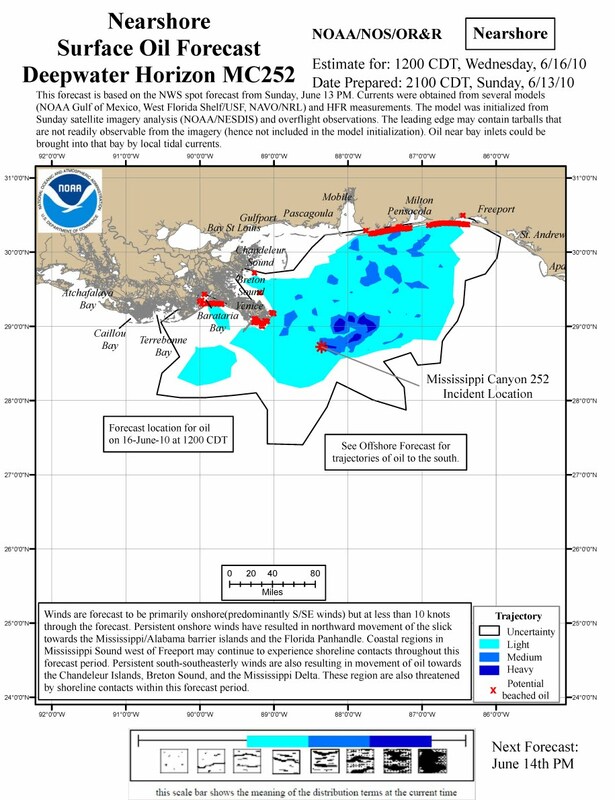 The Department of the Interior personnel are assigned to several locations in the Gulf of Mexico to assess and mitigate impacts resulting form the Deepwater Horizon oil spill. For more information regarding the response effort visit the following website, http://www.deepwaterhorizonresponse.com/go/site/2931/. Weather: Significant fire potential is forecast today for southeast Arizona and western New Mexico due to possible dry lightning. Significant fire potential is also expected in western and southern Colorado for dry, gusty winds. Portions of the Four Corner states will have winds again today. Click here for a map of statewide fires. Eagle Trail (Tok Area Forestry, Alaska Department of Forestry): 17,934 acres at 93 percent contained. This fire is burning one mile south of Tanacross. This will be the last report unless new information is provided. Information: Call 907-883-6200 or visit the AICC website. Popavich (Fairbanks Area Forestry, Alaska Department of Forestry): 2,100 acres at five percent contained. This fire is seven miles northwest of Healy. This will be the last report unless new information is provided. Toklat 2 (Tanana Zone, Bureau of Land Management): 188,807 acres. This fire started on state land 25 miles southwest of Nenana. Structures are threatened. Information: Call 907-356-5864 or 907-715-1634 or visit the AICC website. Brooks Creek (Tanana Zone, Bureau of Land Management): This fire was contained at 145 acres. NEW Hardy (Flagstaff District, Arizona Department of Lands): 282 acres at 25 percent contained. This fire is two miles southeast of Flagstaff. Numerous structures and major power lines are threatened. Eagle Rock (Kaibab National Forest): 3,420 acres at 60 percent contained. This fire is 11 miles northeast of Williams. Fire activity was minimal. Information: Call 928-635-5687 or visi the incident site. Horseshoe (Coronado National Forest): 3,250 acres at 25 percent contained. This fire is five miles south of Portal. Information: Call 520-388-8484 or visit the incident site. Paradise (Apache-Sitgreaves National Forest): 3,700 acres. This fire is 16 miles southwest of Alpine. The fire was very active yesterday. Information: Call 928-333-4301 or visit the incident site. NEW Water Creek (Glenwood Springs Field Office, Bureau of Land Management): 175 acres at five percent contained. This fire is eight miles northwest of Rifle. Medano (Great Sand Dunes, National Park Service): 4,541 acres. This fire is 19 miles southeast of Crestone. NEW Flyin H (Boise District, Bureau of Land Management): This fire was contained at 325 acres. Dove Springs (Twin Falls District, Bureau of Land Management): This fire was contained at 1,530 acres. Tecolote (Santa Fe National Forest): 812 acres at 70 percent contained. This fire is 15 miles northwest of Las Vegas. Municipal watershed was impacted. Information: Visit the New Mexico Fire Info website. South Fork (Santa Fe National Forest): 13,518 acres at 30 percent contained. This fire is 20 miles west of Espanola. A municipal watershed was impacted. Ft Bliss 2 (Las Cruces Office, Bureau of Land Management): 5,160 acres at 80 percent contained. This fire is 15 miles southeast of Las Cruces. No new information was provided. Aspen (Gila National Forest): 3,000 acres at 60 percent contained. This fire is 26 miles northwest of San Lorenzo. No new information was provided. Cutoff (Guadalupe Mountains National Park): This fire was contained at 10,362 acres. are in place, prepared and ready to respond. determining if vegetation is within prescription for burning. Yosemite will improve fire plans to address specific site conditions. the implementation of all prescribed burns. danger, fire behavior, and weather. The park will ensure sufficient communication between all park staff. the prescribed burn have not been established. 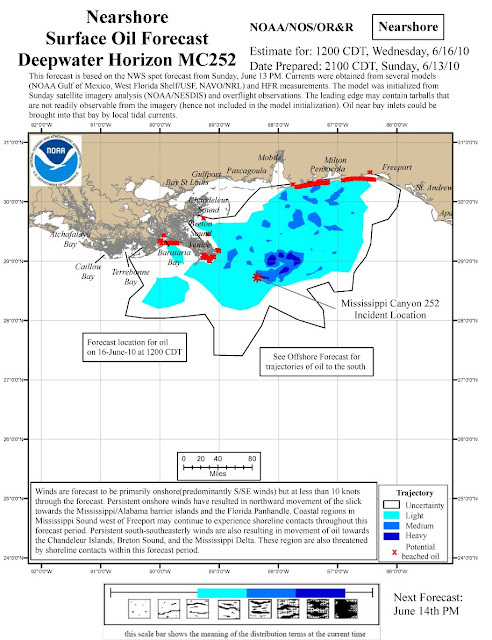 On June 12, 2010, oil from the still-leaking Deepwater Horizon well was particularly visible across the northern Gulf of Mexico when the Moderate Resolution Imaging Spectroradiometer (MODIS) on NASA’s Aqua satellite captured this image at 1:55 p.m. Central Daylight Time. Oil appears to have reached beaches and barrier islands in Alabama and the western Panhandle of Florida. Close to the location of the well, the oil appears gray, but to the northeast, it is bright silver. The increased brightness does not necessarily mean the oil is thicker or more concentrated there; it may simply be that the oil is located in the sunglint region of the image—the spot where the Sun’s reflection would appear if the water surface was as perfectly smooth as a mirror. Normally, waves blur the Sun’s reflection, diffusing its brightness. Oil smoothes the water surface, making it a better mirror. When the slick appears in that part of the image, viewing conditions are ideal, and the patches and ribbons of oil are extremely bright. When the oil slick is not in the sunglint part of the image, however, it may be imperceptible against the dark background of the ocean. The large image provided above is at MODIS’ maximum spatial resolution (level of detail). Twice-daily images of the Gulf of Mexico are available from the MODIS Rapid Response Team in additional resolutions and formats, including a georeferenced version that can be used with Google Earth. NASA image courtesy the MODIS Rapid Response Team. Caption by Rebecca Lindsey. The maps below are updated daily. Live video links from the ROV's monitoring the damaged riser. Please be aware, these are live streams and may freeze or be unavailable from time to time. AEU suspending all burning permits within SRA of Amador and the west slope of El Dorado counties. Amador and the west slope of El Dorado counties. Lake Tahoe Basin, for burn information in this area call (530) 543-2600.